My 2013 writing income post brought up a number of good questions in the comments. And one odd question about my bedroom habits and whether or not I was a first-rate lover … but that might have been spam. Either way, I’m not going to address that one here. But I did want to talk about the rest. Author Laura Resnick talks about her 2013 income in the comments. A Publishing Perspectives survey suggests that the majority of authors earn less than $1000/year. Chuck Wendig suggests the Publishing Perspectives survey may be full of crap not entirely accurate. Jami Gold’s roundup of publishing/income/pricing surveys and information. Author Michael Sullivan shares his anger about writers’ income. Based on some comment conversations, Martin wrote a blog post about the German SF/F market for foreign authors. A lot depends on the contracts. Advances are often broken into multiple payments. For books three and four of the Magic ex Libris series, I get part of the advance on signing (once DAW has received and processed the signed contracts), part upon the delivery and acceptance (D&A) of the final, revised manuscript, and part on publication. I’ve gotten the on-signing money for books three and four, but that’s all so far. I’ve turned in the manuscript for Unbound, and once my editor gets back to me, I’ll do another revision. When that’s accepted, I’ll get the second portion of the advance (D&A) for that book. How everything breaks down depends on the size of the advance, too. Say Author X is getting 90% of their money as royalties and only 10% as advance money. This could mean they have a very small advance. It could mean a big advance but the book sold a lot more copies than expected. It could mean a large backlist of titles that have earned out and are generating royalties. If someone never earns out and gets any royalties, does that mean their books don’t sell, or does it mean they got huge advances? I signed contracts for three new books in 2013, which means there’s a higher-than-normal proportion of on-signing advance money. 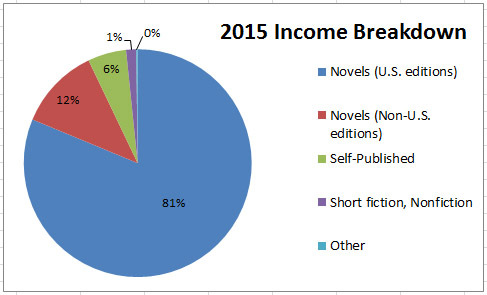 Here’s how the $55,000 or so of U.S. novel income (before taxes) breaks down for 2013. DAW operates on six-month royalty periods, 1/1 – 6/30 and 7/1 – 12/31. Since most of my books have earned out their advances, this means I get royalty checks on a fairly regular and predictable twice/year schedule (usually around April and October). The payment process isn’t quick, by any means, but I haven’t had trouble getting paid by the major publishers. I’ve occasionally had smaller checks get delayed or forgotten, but in general, a nudge from either my agent or myself has been enough to shake those loose. You listed your self-published income. 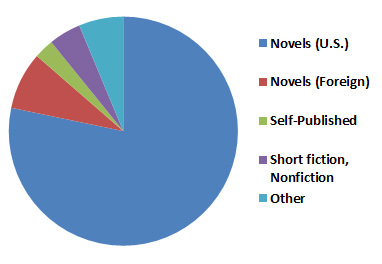 How many titles have you self-published vs. your traditionally published work? I’m primarily a traditionally published author. My nine fantasy novels are all in print from DAW Books. I’ve self-published three short collections, which you can see at the bottom of my Bookstore page. I also self-published my non-genre novel Goldfish Dreams. Given that the majority of my work is published by DAW and other major publishers, it should come as no surprise that most of my income is from those same sources. When those books go out of print with DAW, I certainly plan on self-publishing them myself in order to keep my backlist available. Personally, I think the whole Self-Publishing vs. Traditional Publishing argument is rather silly, but that hasn’t stopped people from using my initial blog post to show why one side or the other is the Right way to publish. All I’ll say is that this way is working pretty well for me right now. The numbers I posted were pre-tax, which means a chunk of it will be going right back out. Last year, I paid estimated quarterly taxes that totaled around $5000 (based on my 2012 income) against what I expected to make in 2013. I also have a pretty high deduction on my income from the day job, so some of that spills over to pay for taxes on the writing. I honestly won’t know how much I’m paying in taxes until I get the rest of our W-2s. A bit of hunting around online for self-employment tax calculators suggests that for self-employment income of $60,000, I could expect to pay a total of about $8500 in federal taxes, and an unknown-but-smaller amount in state taxes. But so much depends on other factors, which means I honestly don’t know. What about your agent’s cut? The numbers I posted are after my agent takes his commission. Why are your expenses so low? Are you forgetting to take some tax deductions? I messed up a bit on this part, and I apologize for that. The expenses I listed were only those that I had dollar amounts for in my annual writing budget spreadsheet: hotel costs, postage, etc. They omitted things I don’t calculate until I start doing my taxes, like mileage or meal allowances. And I was indeed missing a few deductions — thank you to folks who pointed those out. I’ve always been a bit conservative about taking deductions, though I’m moving away from that. Having started working on taxes, here’s a better accounting of my writing expenses for 2013, which come to a total of $6,861. Yeah, I really messed up the initial estimate there. Mileage: 4,290, which comes to a mileage deduction of $2,424. Meal Allowance: $2,517, of which I get to deduct half. What exactly do you mean by foreign sales? Does your UK deal for Magic ex Libris count? Good question. I was not counting the UK deal, in part because of how my contracts work. My agent negotiated a deal with DAW wherein DAW gets the rights to publish the books in English in the U.S. and Canada. DAW also gets certain other rights that they can sublicense, including things like putting them out in audio, selling them to a book club (in English), or licensing the UK edition to a UK publisher. I get paid when any of these things happen. As I understand it, these payments are usually applied against the advance, but since Libriomancer earned out pretty quickly, money for the book club, audio books, and UK deal just got bundled in to the royalties payment from DAW. DAW did not get non-English rights, which means when we sold the Magic ex Libris books to Germany, for example, that deal was directly with me and my agent. When I get paid for those, the money comes from the German publisher to my agent and then to me, instead of going through DAW. Yes. I don’t know how much, but my hope is that I’d be able to consistently produce at least two books a year, as opposed to the one/year schedule I’ve been on for so long. If I could do that — especially if I could branch out a bit with some of those books — I think it would lead to a significant increase in the writing income. Or maybe I’d just spend more time blogging and posting on Twitter. Hopefully someday I’ll be able to put that to the test. My income posts from previous years are here: 2007, 2008, 2009, 2010, 2011. 2012 was an odd year. In many ways, it’s the best year I’ve ever had as an author. My eighth book with DAW came out in hardcover, and went through four printings in the first few months. I won a Hugo award. I saw some of my books come out in audio format for the first time ever. The goblin books were re-released as a trade paperback omnibus, and also sold to the Science Fiction Book Club. So it was a little weird at first to realize that I made significantly less money in 2012 than I did in the prior year. The grand total for 2012 was $33,598.19 before expenses and taxes and all the rest. Compare that to almost $43,000 from 2011. I figured the reason for the drop was pretty straightforward: I didn’t sell any new books to my U.S. publisher last year. The deal for Libriomancer and Codex Born was made in 2011, and while I have ideas for book three in the series, I haven’t pitched it yet. So while 2012 saw some money for delivering the final manuscript for Libriomancer and the on-publication payment, it wasn’t as much as the on-signing advance for those two books last year. At least, that’s what I had assumed … and then I started looking at the numbers more closely. 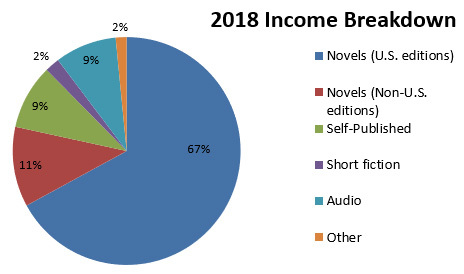 Thanks to royalties and subrights sales (audio and SFBC), my U.S. novels actually made more than they did last year. Turns out it was the foreign sales that saw the real drop, and I’m not sure why. The income from my self-published titles jumped a bit, probably in part because I put another collection out midway through the year. 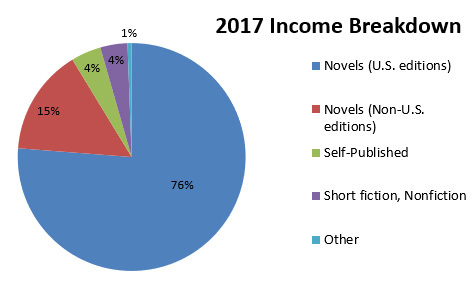 I didn’t write or sell much short fiction last year, which is part of why the miscellaneous income (from speaking fees, a few nonfiction pieces, and reprint sales) is the smallest category. I’m still sorting out expenses for the year, but it looks like that’s going to come in around $2000 or so, mostly for conventions. That’s been fairly steady for several years now. I actually made it to a few more conventions, and did a little more traveling last year, but several of those were Guest of Honor gigs, which helped balance things out. The other interesting thing (to me) is how erratic the checks were. I made a total of $115 in the month of January, but February was an awesome month, with more than $6000 showing up in the mail. March and April went the same way. The fact that I have a full time day job means I’ve got a steady income I can count on for most of our day-to-day needs, but if I’m ever able to go full time as a writer, I’m going to have to be a lot more careful about budgeting for the long term. That was my 2012. Please remember I’m just one author, and you can’t make sweeping generalizations from a sample size of one. But I hope the information is useful, and as always, I’m happy to answer any questions. For the writer folks, are you reading Kristine Kathryn Rusch’s blog? She has a great deal of experience in the industry, and her posts are worth reading and thinking about, even if I occasionally disagree. Case in point: last week she wrote about auditing your agent, and shared her personal experience with Unnamed Agent who … well, let’s just say they weren’t terribly diligent about getting her all the money she deserved. She makes a lot of good points. And while I haven’t seen anything to suggest similar problems with my own agent, it’s good to keep these things in mind, and preferably to be aware of them before rushing into a relationship that will affect your career. A friend pinged me to let me know my name had come up in the comments, where someone was suggesting I should read the post, because it could help me. Another person referenced something I wrote last year about why I was keeping my agent, thanks. Let me start by saying I genuinely appreciate people’s concern for my career and financial well-being. I’ve spoken to a lot of self-published authors, both those who went indie from day one and those who started with commercial publishing and switched over to self-publishing. I’ve self-published three collections and one novel, partly for the additional income, and partly for the experience. As my books revert back to me, I fully intend to self-publish those as well to keep them available. After looking at the different options and talking to people who have gone down those different paths, I’ve chosen to keep my agent and publisher. I choose to stay with DAW and JABberwocky because I’ve determined that this is what’s best for me and my career at this time. That doesn’t necessarily mean it would be best for you. Everyone’s career is different, and there’s no one right way to do this. The person who mentioned the hundreds of thousands of dollars I should be making also said they saw my books in kids’ hands as often as Twilight and Hunger Games. Which is awesome anecdotal data, but I’ve seen my sales numbers on Bookscan. I’ve been pretty successful so far, but I’m nowhere near Meyer/Collins levels of success. My situation is my own. I choose to write part time, and to keep a full time day job. I have several chronic health conditions, a partially disabled wife, and a special needs child. And I live in a country that doesn’t have universal health coverage. I could find an insurance plan on my own, but it would be pricy. Health Care Reform will hopefully create more options, and I’ll revisit my situation as things change. But for now, I do choose to be a bit conservative when it comes to the health and care of myself and my family. So thank you again for the concern, but I’m doing okay. My latest book hit the Locus Bestseller List, is in its fourth printing, and looks like it will have earned out a five-figure advance in three months. 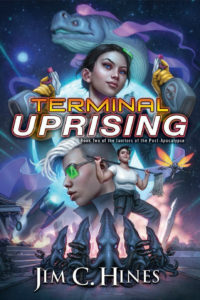 It’s been picked up in Germany and the UK so far, as well as by the Science Fiction Book Club (deals arranged by my agent and my publisher, respectively). My earlier work is still in print, and is being re-released in omnibus (Goblins) and audio (Goblins and Princesses) editions, as well as ongoing foreign deals (Stepsister Scheme just came out in Turkey). I agree with Rusch that it’s important to go into a business relationship with your eyes open. I know I didn’t always do that when I was starting out, and in some ways, I got very, very lucky. I also agree that not everyone needs an agent, and that there are a lot of scams and pitfalls out there. But I have done research, and I continue to pay attention to different options and opportunities. I talk to different authors, some more successful, some less. Some commercially published, some self-pubbed. Some with representation, some without. This is my career. I watch what’s happening in the industry, and I take it very seriously. And I am indeed quite happy with where I’m at right now. Thanks!